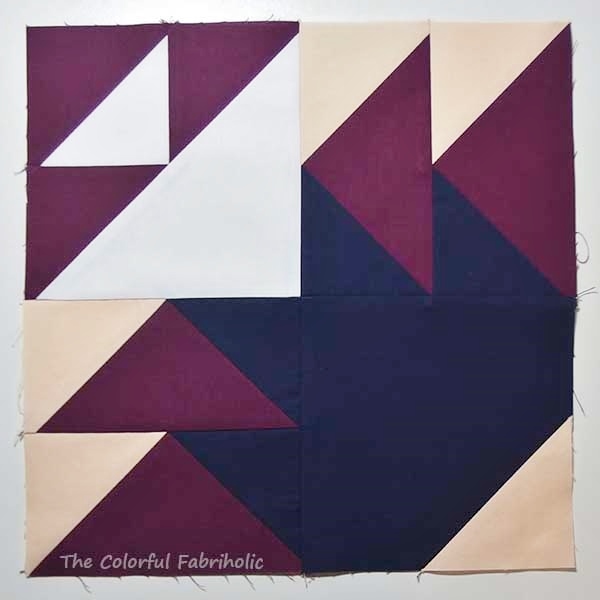 Welcome to my stop on the Paintbrush Studio New Block Blog Hop! Paintbrush Studio (formerly known as Fabri-Quilt) has generously sponsored this new block design blog hop by providing FQ cuts of the Ocean Sunrise color palette to all participants. Each designer creates a block and writes a tutorial for it, which you can see by visiting all the posts. Then all the blocks will be used in donation quilts. 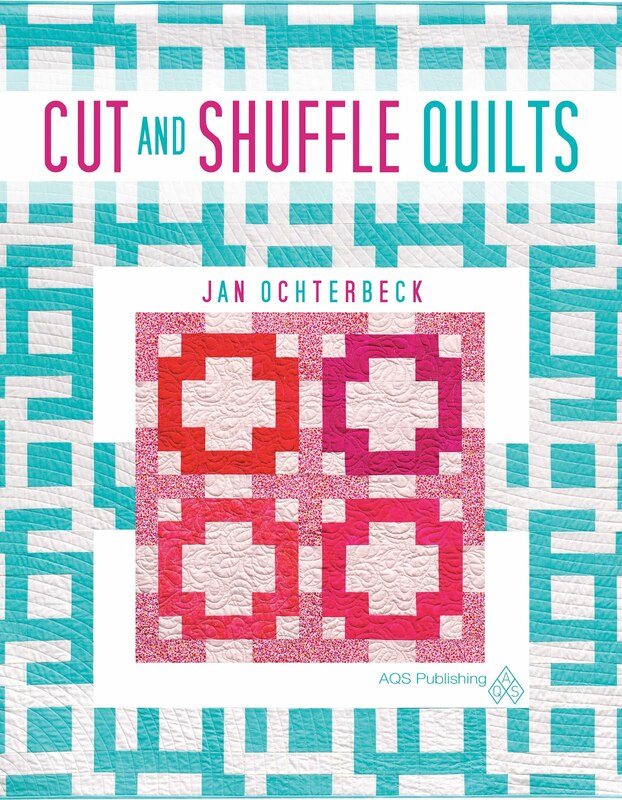 Stephanie @Late Night Quilter, Cheryl @Meadow Mist Designs, andYvonne @Quilting Jetgirl are hosting this project. 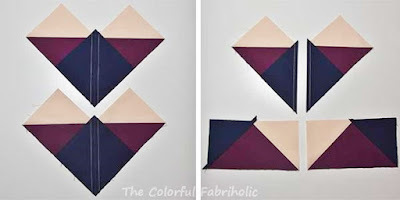 The Beary Goosey block is for the intermediate level sewist. 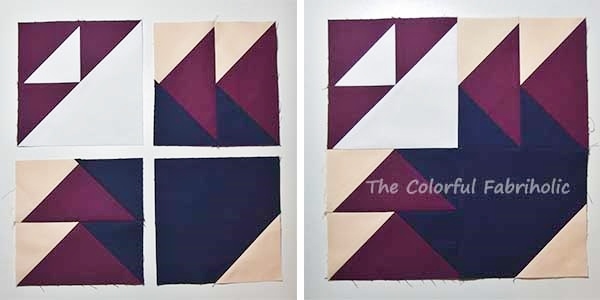 Some experience with flying geese, HSTs, and bias seams is recommended, although this block would be a great skill-builder for a confident beginner. 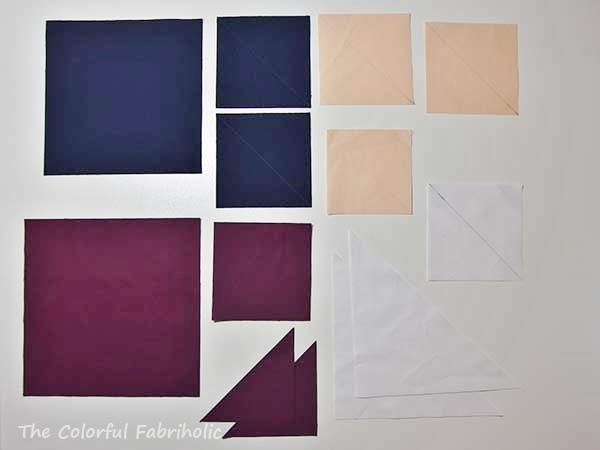 My block uses four of the six colors in the palette, Midnight, Bordeaux, Peach, and White. Prewashing the fabrics is recommended to preshrink the fabrics and remove any excess dye. Instructions are written for one block which will finish at 12" (12-1/2" unfinished). All seams are 1/4". 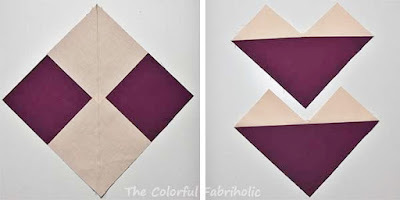 o Cut 1 (one) 6-7/8” square and cut on the diagonal for two triangles. Set one aside; only one is needed for the block. The Beary Goosey Block is assembled in quadrants. b. Cut ¼” outside the sewn line (or between the stitching if making the bonus HST) and press the corner out. a. Place two 3-7/8” peach squares on large Bordeaux square as shown and stitch ¼” on each side of the marked diagonal line. b. Cut on the line between the stitching and press the points out. 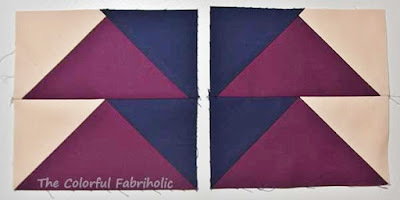 c. Align a 3-7/8” Midnight square on each unit and stitch ¼” on each side of the marked diagonal. d. Cut on the diagonal and press the corners out; trim. You now have two mirror-image pairs. 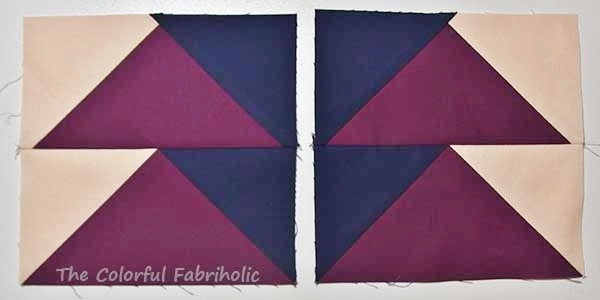 e. Sew matching pairs together to form block quadrants. a. 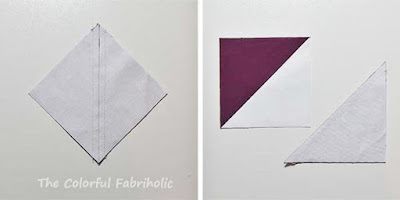 Make HST: Place the 4” white square together with the 4” Bordeaux square. 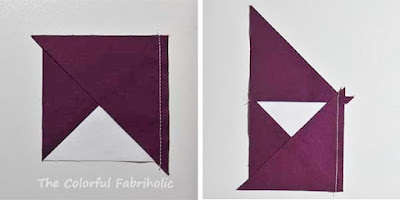 Sew ¼” on each side of the marked diagonal. Cut between the stitching lines. Press one HST open and square up to 3-1/2”. (Set aside one HST, not needed for one block). b. Sew wings onto HST: Align one Bordeaux triangle as shown, stitch and press the point outward. Then align the other triangle and stitch. Press and trim. 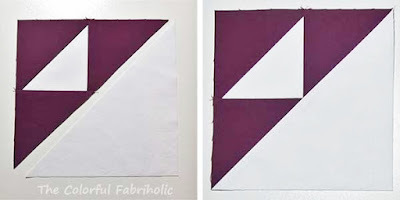 c. Sew large white triangle to Bordeaux triangle assembly, press outward, and trim. 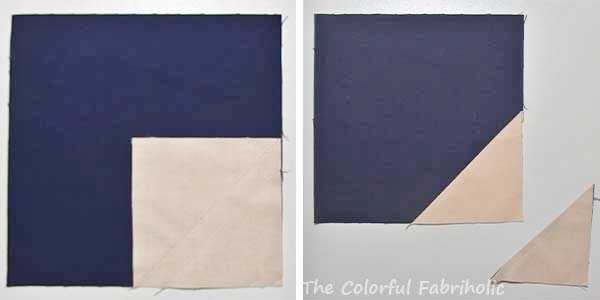 If any dark seam allowances show under the white, carefully trim them away. 1. Lay out block quadrants as shown. Be sure that the Midnight triangles of the flying geese units are next to the Midnight quadrant. 2. 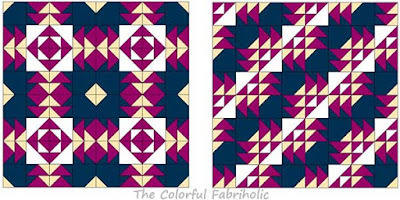 Sew quadrants into rows. Press toward the white and Midnight quadrants. Join rows together; press. You can create some really interesting and unique layouts using the Beary Goosey Block. Some secondary surprises happen when you rotate the blocks different ways. In some cases the peach triangles come together to make even more Flying Geese. Here are illustrations of a few layouts. Jan @The Colorful Fabriholic - you are here! Be sure to enter the giveaway, 6 half-yard cuts of the Ocean Sunrise palette from Paintbrush Studio, details at Quilting Jetgirl. Thanks, Paintbrush Studio, and thanks, Yvonne, Cheryl, and Stephanie! I like this block! It's so much fun seeing a block in different layouts. There can be some dramatic changes by just flipping and turning! Thank you! 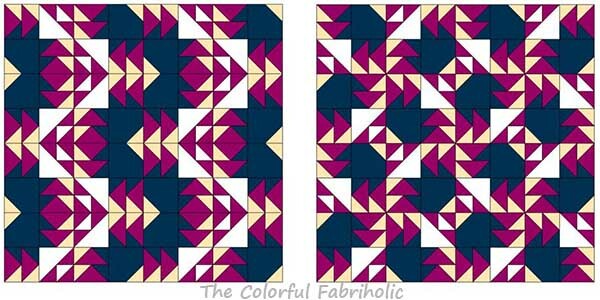 Beautiful block and very versatile! 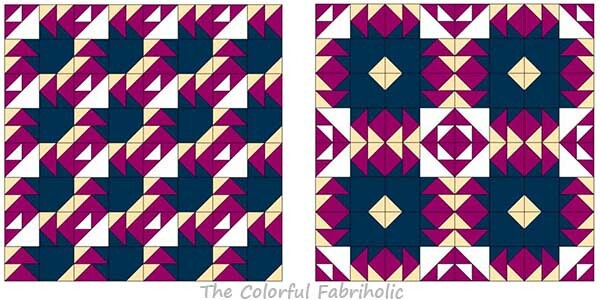 I love seeing different layouts just from one block! The colors are beautiful! So many different looks from one block. This is so cute...and the name is irresistibly cute!!! Such a great tutorial! Love all the possibilities with this block and am quite intrigued by the straight set. I think it's great that you came up with a block that has so many options to play with. Such a great name. I love the diagonal set layout! Just gorgeous! Love all the possible layouts with this block. Great job! This is one of my favorite blocks too. Wow. I am so enjoying everyone's creativity. Great job! Nice block! I love all the different layouts. Stop the Presses!!! What an excellent block!!! Holy moly, look at how drastic a quilt layout changes when you rotate this block! That's amazing, well done! It is amazing the different looks from that one block.